The Illinois Statehouse installed several holiday decorations this year: A Nativity scene depicting the birth of Jesus, a Christmas tree, a Menorah and … a Satanic sculpture. Entitled “Snaketivity”, the display depicts a snake wrapped around a woman’s hand as she holds an apple. On the side of the sculpture is the logo of the Satanic Temple – the head of Baphomet inside an inverted pentagram – and the words “Knowledge is the Greatest Gift”. The satanic display at the Illinois Statehouse rotunda. The symbolism of this sculpture refers to the book of Genesis and goes to the very core of Luciferian philosophy. It represents Eve grabbing the “forbidden fruit” of knowledge that was given to her by Lucifer who took the form of a serpent. Lucifer told Eve that biting the fruit would allow Adam and herself to become “like gods, knowing good and evil”. This is known as the “original sin” which God to expel Adam and Eve from the Garden of Eden. To Luciferians, the serpent is not a deceiver but a “savior” who allowed humanity to access the knowledge required to achieve divinity through its own means. The marking under the sculpture saying “Knowledge is the Greatest Gift” refers to the “gift” given from Lucifer to man in the form of divine knowledge. This interpretation of the book of Genesis has been, for centuries, a core difference between theistic religions and occult schools. Despite the very biblical meaning of its display, the Satanic Temple insists that its goal is not about proselytizing for its own religion. Next to the sculpture, the Satanic Temple also installed an also inscription saying: “Religion is but myth and superstition that hardens hearts and enslaves minds”. 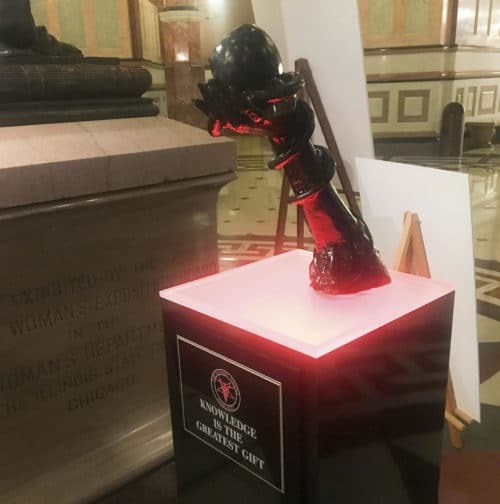 Dave Druker, the spokesman for the secretary of state, confirmed that the Chicago-based Satanic Temple had the right to place its sculpture on display inside the statehouse. This is not the first PR stunt conducted by the Satanic Temple. And, every time the Temple does something, media sources make sure to emphasize that the Satanic Temple is “not a group of devil worshipers, but liberal political activists who oppose the increasing influence of the religious right in American politics”. However, despite its venerable speeches about its “principles” and “separating church and state”, all it actually accomplishes is having Satanic stuff put on display in public spaces. Here are some examples of its stunts. 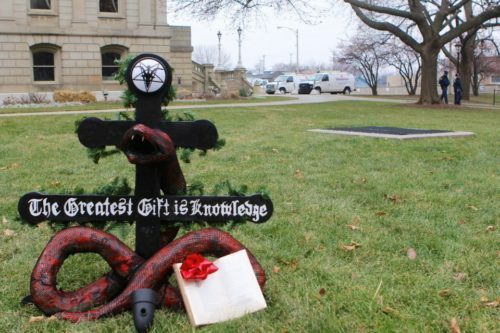 In 2014, the Satanic Temple installed a “holiday” display in front of the Michigan Capitol. The snake and the cross form the symbol of the Satanic Cross, which is based on the alchemical symbol of sulfur. Why sulfur? Because the Bible says that Hell smells of sulfur. Next to the display was a warning to potential vandals. 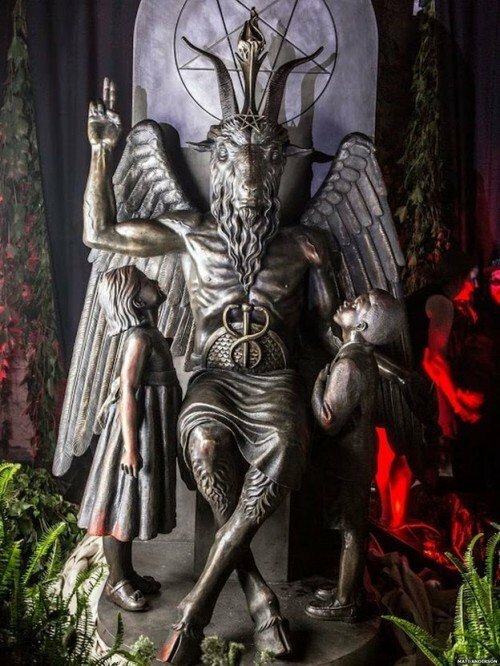 In 2015, the Satanic Temple unveiled a massive statue of Baphomet in Detroit in what was dubbed “the largest satanic event in history”. Two children looking up to Baphomet. The unveiling took place in an industrial building near Detroit River after attempts to have the Baphomet sculpture installed at the Oklahoma State Capitol failed. Entry to the venue required guests to sign a contract “selling their souls to the devil”. The proceeds from the event went to support abortion rights – one of the Temple’s favorite causes. 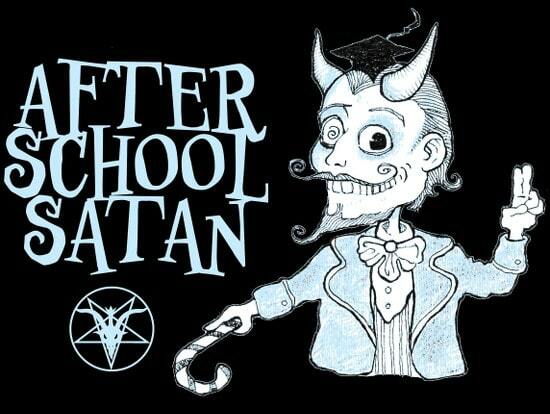 In 2016, the Satanic Temple created an after-school program called After School Satan. The program is up-and-running in several cities across the United States, including Atlanta, Los Angeles, Salt Lake City, Pensacola, Washington, D.C., Tucson, Springfield, MO, Seattle, WA, and Portland, OR. The logo alone should be a red flag to parents. A devil-horned, one-eyed creep offering candy to children while doing Baphomet’s sign “As above, so below”. The spiral in one of the eyes is similar to the symbol used to identify “child lovers”. The Satanic Temple is also working on other projects. 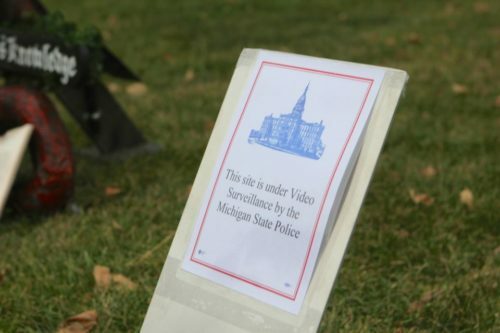 The West Michigan Friends of The Satanic Temple are currently raising money on a GoFundMe page to bring their own “Satanic holiday monument” to the Michigan state Capitol. Although media love to say that the Satanic Temple is about “science” and “rationality”, the fact remains that it did not advance any of these causes throughout the years. The only thing the Satanic Temple actually managed to accomplish is fully on-par with the elite’s agenda described on this site: To normalize satanism and its symbolism in the public space while making it appealing to the masses. This article first appeared at Vigilant Citizen.